Potassium fulfills a long list of jobs in the body, including helping to regulate water balance (via the active transport pump), maintaining pH balance, maintaining blood pressure levels already within the normal range and supporting neuromuscular function. Although there’s plenty of potassium in many natural foods, commercial over-processing results in the loss of potassium and increases the sodium content. The ratio may be as high as 4:1 in favor of sodium. In addition, certain diseases and physical exertion can also deplete the body of potassium. Adequate potassium levels are essential for the body’s active transport pump, which moves nutrients into cells. 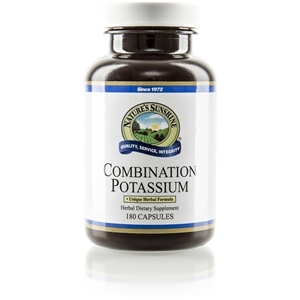 This herbal formula provides essential potassium from several rich, natural sources. It provides 42 mg of elemental potassium per capsule. Potassium, kelp leaf and stem, alfalfa aerial parts, dulse frond, horseradish root, white cabbage leaf, horsetail stem and strobilus.